The fifth annual Eat Drink SLC is happening Wednesday, July 10th 2019 from 6:30-9:30pm. Every year, it sells out days in advance so grab your tickets early. Be sure to visit us on Instagram and Facebook, and check out our photo gallery. EAT | Celebrate Salt Lake’s coming of age as a culinary hotspot by sampling the best in seasonal fare from many of our finest restaurants and food purveyors. DRINK | Sip wines from an international selection of boutique wineries. Taste craft cocktails from small batch distillers. Enjoy local beer from award-winning Utah craft brewers. SLC | All proceeds benefit local non-profits that enhance our community and our lives. Eat Drink has raised over $45,000 for worthy causes such as Comunidades Unidas, Race Swami, Tracy Aviary, and SB Dance. Our 2019 community partner is Neighborhood House. Must be 21 and over. Must bring ID. Not refundable. Includes complimentary signature glass and all food and beverage. Eat Drink SLC July 10th 2019 from Stephen Brown on Vimeo. Eat Drink SLC began in 2015 and has sold out every year. Since its start, Eat Drink has raised over $45,000 for our nonprofit beneficiaries. Please be sure to join the email list below so you’ll know when tickets go onsale and about special events throughout the year. Salt Lake is experiencing a new urbanism that supports a thriving and vibrant culinary community. As the valley changes, its tastes are changing with it. The growth of chef-driven and owned restaurants and rise of craft beverages, urban wineries and distilleries are elevating the city’s palate. Not just a food festival that happens to feature a few wineries, not just a wine festival with some food to nibble on — Eat Drink SLC is a true communion between food and drink, pairing a diverse group of independently owned local restaurants with complementary wineries, distilleries and breweries. Eat Drink SLC’s format promotes the marriage of food and libations in a way unduplicated by other Utah events. Eat Drink SLC invites food and libations lovers aged 21 and over to nibble and nosh, sip and swirl the evening away while enjoying live music on the Aviary’s cool, green grounds. Festival-goers will sample seasonal fare from many of Salt Lake’s leading restaurants and purveyors; sip from a selection of 80 wines from an international assortment of family-owned wineries; taste craft cocktails from small-batch distilleries, including several which are locally owned & operated; and enjoy local beers from award-winning Utah craft brewers. With tickets priced at $90 (includes all food, drink, and a wine glass), this summer evening social is an approachable, affable and appetizing way to support three local nonprofits that enhance Salt Lake’s community. Presenting drink curator Vine Lore Wine and Spirits is joined by an impressive list of award-winning Salt Lake City restaurants and mobile food businesses. 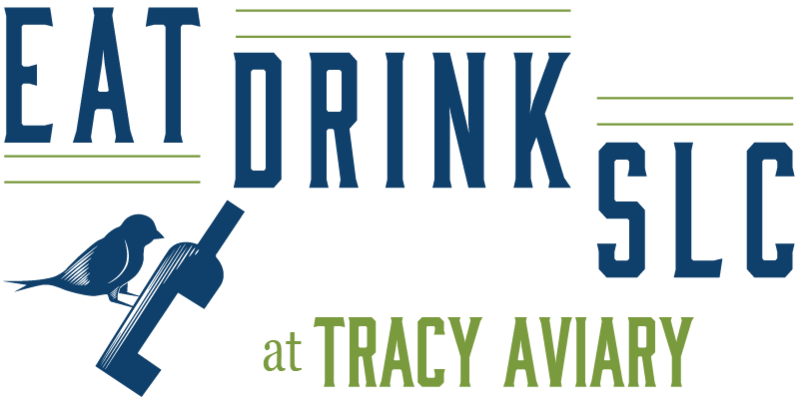 Eat Drink SLC is hosted under a nonprofit partnership umbrella consisting of Tracy Aviary and SB Dance. These two organizations represent, respectively, a place and an arts-maker that contribute to the unique character of our community. A third nonprofit – Comunidades Unidas in 2015 and Race Swami in 2016 and 2017, and Neighborhood House in 2018 and 2019 – represents an organization that especially empowers underserved youth from Salt Lake’s west side, many of whom are from families involved in the food and beverage industry. Eat Drink SLC’s mission is to honor the entire industry’s food chain including customers, business owners, managers, servers, culinary professionals, purveyors and agricultural workers. Whether you're visiting Salt Lake for business or pleasure, you're in for a great time. If you're still in the planning stages, start by browsing hotels, restaurants, and attractions, and adding them to your Visit Salt Lake trip planner. Locally-owned fine wine and craft spirits brokerage made up of passionate advocates and knowledgeable educators dedicated to bringing the best in wine and spirits to Utah. Bred for no-holds-barred creative rampage, SB Dance blends theater, movement, and object into work that oozes with irreverent humor, poignant drama, sensuality, athletic feats, strange beauty, and naked reality. With over 70 years in the food distribution service, Nicholas & Company delivers exceptional products and services throughout a six state area. Mountain West Hard Cider Company, proud member of Utah’s Own, sources only the finest local ingredients from the Mountain West region to craft every day, seasonal, and artisan award-winning hard apple ciders. Mountain West is owned and operated by husband-and-wife, Jennifer and Jeff Carleton. Along with cidermaker Joel Goodwillie, they share a passion for the community, locally-owned business, and obviously – good times with good friends. From the very beginning, Red Rock Brewery set out to brew high-quality craft beers and serve delicious food. In the shadows of the Wasatch range, we’ve created a line of premium gins that embody the individuality of the West. Originally crafted in the 1940's, Medley Bros. was the collaboration and love of five bourbon-loving brothers. Now, nearly 75 years later, we are bringing it back. A variety of fine handcrafted liquors and on-site tastings at the distillery. We are Julia and Alan Scott, the creators of Waterpocket® Craft Distillery, and the hands-on makers of our spirits lineup. We are delighted to pull from our scrapbooks, journal, and tasting notes to produce an itinerary of sensory and spirited adventure for you. Our wanderlust brought us to Utah, where we realized a lifetime of exploration can be had in the mountains, canyons, deserts, and wildernesses of this beautiful state. The Waterpocket Fold gives form to the Capitol Reef and the national park that bears this name, and now gives its name to Waterpocket® Distillery. As a family-owned company, 3 Badge Enology is committed to sourcing select wines from various winegrowing regions throughout the world. Established by David and Ginny Adelsheim in 1971, during a different era in America when an idealization of going back to the land, a vision of a lifestyle focused on wine, and faith in one’s own abilities could stand-in for a business plan. Appellation Wine Company is a unique portfolio of family estate wineries, proudly working together to grow and market world-class wines that reflect the historic soils from which they came and the passionate commitment of the families involved. Founded in 1973 by Fred T., Joseph S. and John Franzia, Bronco Wine Company is a family-owned winery committed to growing, producing and selling the finest quality wines of the highest value to our customers. C Mondavi and Family, Napa Valley's oldest winery established in 1861 by Charles Krug and stewarded by C. Mondavi & Family since 1943, has been dedicated to producing exceptional Napa Valley wines fro more than 150 years. Committed to making world-class wines from the Snake River Valley, Cinder is blazing the trail under the direction of award-winning winemaker Melanie Krause. Fine wines and artisanal saké that beckons the adventurous and guided by the belief that quality is the result of passion, talent, and terroir. Co-founded by Dan and Margaret Duckhorn in 1976, Duckhorn Vineyards has spent almost forty years establishing itself as one of North America’s premier producers of Napa Valley wines. One of the pioneers of the Willamette Valley, second-generation winemaker Adam Campbell oversees six vineyard sites with 350 planted acres. The family’s goal is hand-crafted, Estate-grown cool climate ­wines that rival the best in the world. French Libation was born from the merger of The Wine Sailor, a fine wine company created by Emilie Terrier from Grenoble and French Brews & More, a humble craft beer and cider portfolio gathered by Adrien Carrard from Marseille. They were friends and colleagues and shared the same passion for great products and great people, so naturally decided to work together and create French Libation. Since 1812, Laurent Perrier champagne has been celebrated for its trademark freshness, lightness, and elegance. For over 35 years, Leonardo LoCascio Selections has represented Italian wines of impeccable quality, character and value. Each wine in the collection tells a unique story about the family and region that produced it. A taste through the portfolio is a journey across Italy’s rich spectrum of geography, history, culture and cuisine. Dry true rosé made from old vine Grenache, Carignan, Mourvèdre and Cinsault. Our grapes are hand picked specifically for Rosé, direct to press, fermented in stainless steel and bottled at complete dryness. Made with love by mother-daughter team Melinda Kearney and Michèle Lorenza Ouellet--celebrating 10 years of Lorenza Rosé! Cabernet-centric portfolio includes wines that are complex and rich, balanced and expressive of Napa Valley’s fruit but also reflective of classic styles. Each year we harvest by hand the best blocks from acclaimed vineyards in the most celebrated wine-producing region in the world – Napa Valley. Mira wines are hand-crafted, all natural, and a true expression of what the vines produce from year to year. Redefining the Old and New Worlds, our portfolio is comprised of a comprehensive collection of wineries reflecting the very best of Argentina, Chile, Spain, Portugal, and beyond. Farmers, coopers, winemakers- intimately involved in the creation of our single vineyard wines from Napa, Carneros and the high Mayacamas Mountains. Wines: Poseidon Chardonnay, Obsidian Ridge Cabernet. Piattelli Vineyards has a total of 16 different wines including Malbec, Trinità, Cabernet Sauvignon, Rosé, Torrontés and Malbec-Tannat, with many in reserve, grand reserve and limited edition bottles. Precept Wine is the largest privately owned wine company in the Northwest. We’re seamlessly integrated to run our own vineyards, wineries, sales and marketing, world-class tasting rooms and hospitality. Premium Port Wines is the North American importer for the Symington Family Estates of Portugal and the only specialized importer of Port, Madeira and Douro DOC wines. In a remote, raw territory, where we have looked and admired for decades begins the realization of RAEN. These hills of the Sonoma Coast provide a diversity of soil, elevation and climate that allow for wines of incredible expression, density and length.Our 3 distinct hillside vineyard estates lie within miles of the Pacific Ocean. This climate, these soils and this aspect are diverse and perfect for the ever challenging, tight bunched, thin skinned grapes of Pinot Noir. Our commitment remains to produce the best expression of these sites. Growing premium grapes for the past fifty years and committed to sustainably farming, producing and bottling wines, three Rutherford generations have explored and cultivated some of California’s finest vineyards. Our wines have a sense of soul and authenticity. We regard wine as artisanal crafting and an expression of nature. When nature is respected, it reveals to us aspects and truths of those earthly places filled with traditions and history. In essence, wine evokes memories, emotions, and enjoyment. Inspired New American bistro serving seasonal fare, cocktails & fine wines in the hip Hotel Monaco. Beehive's artisan cheese is made small-batch, by hand, from the creamiest milk cows in Utah. We use only local ingredients to lovingly craft a product. From our family to yours! At Beltex Meats we source everything regionally, and always source from the Salt Lake Valley first. We specialize in whole animal butchery, so give us a call the next time you're looking for that fantastic cut of meat! Founded on the principle that every community in Salt Lake City should have convenient access to fair-trade, specialty coffee and espresso. Cafe Niche has been a neighborhood staple for over 5 years, and now Niche is proud to carry on the tradition of a relaxed, friendly atmosphere with an innovative twist. The fare revolves around the best fresh ingredients prepared in a simple and timeless way to highlight flavors. With an emphasis on supporting local farms, ranchers and food purveyors for the most flavorful ingredients around, Niche sets the table as food-centric community restaurant. Inventive small plates & rotating New American entrees paired with a large wine list in warm digs. Located in the heart of downtown Salt Lake City, Lake Effect is the latest purveyor of craft cocktails and fine dining. Mamachari Kombucha is Salt Lake's only kombucha brewery with a taproom. Manoli’s is a small plates restaurant that reinterprets Greek cuisine in a way that showcases fresh, local and seasonal products. normal® is an ice cream concept by alexa norlin, a normal girl from a normal place. We are located INSIDE the east entrance of trolley square at 602 south 700 east, salt lake city, utah. Cavernous concrete-&-reclaimed-wood bistro with an inventive New American menu & creative cocktails. Quality Culinary School in Salt Lake City. Hands-on programs are as short as 4 weeks! Perfect for entrepreneurs and career changers, and recent grads. Locally sourced, modern American fare served for dinner & Sunday brunch in a quaint setting. Artsy eatery serving creative Mexican fare & margaritas in a colorful space inspired by Frida Kahlo. The culinary team, led by Executive Chef Jonathan LeBlanc, brings contemporary chef-driven Italian fare to the plate, rooted in the classics, utilizing authentic ingredients and techniques but with a fresh approach. Stoneground Kitchen is located downtown in a second-story loft overlooking the architecturally acclaimed Salt Lake City Public Library. Our menu features Rustic Italian Recipes, Thin Crust Pizzas & Fresh Pastas. With their combined experience in fine dining, design and event planning, The Blended Table has created some of the best food, service and ambiance found at catered events. We continually strive to provide our clients with exceptional service, inspired cuisine as well as seasonal, local and organic products whenever possible. We are actively working to create a space where our customers have an opportunity to leave, at their core, happier than when they arrived. The Birdfeeder Café is a concession stand seasoned with a conservation agenda like freshly prepared foods and no single-use plastic containers. Offering public access and our made-to-order menu is served from 8am to 6pm in the summer and 9am to 3pm in the winter. The Bird Feeder Café is a concession stand seasoned with a conservation agenda like freshly prepared foods and no single-use plastic containers. Offering public access and our made-to-order menu is served from 8am to 6pm in the summer and 9am to 3pm in the winter. Salt Lake's best Italian and Neighborhood Joint.Serving up pizzas, pastas, salads and entrees at 2 locations: 680 S. 900 E. as well as 6405 S. 3000 E.
Visit us at www.triodining.com for more restaurant information. A Utah-based cold-pressed juicery with three locations along the Wasatch Front. Fueled by love, local farms, dance parties and an obsession for juice. Waterlogue is a consultancy focused on epicurean mineral waters, and soon to be purveyor of fine waters from around the world, curated by certified Water Sommelier Fong Hsu. Vintage-chic lounge & eatery featuring imaginative American bites & a huge beer & whiskey selection. A healthy lunch/dinner spot that won't weigh you down. Organic. Gluten-free. Tasty. Tickets are redeemable for certain goods, services or experiences offered by, or facilitated through, the Merchant. The Merchant is solely responsible for redeeming the Ticket. Furthermore, the Merchant is fully and solely responsible for the care and quality of all goods and services it provides to you and for any and all injuries, illnesses, damages, claims, liabilities and costs (“Liabilities”) it may cause you to suffer, directly or indirectly, in full or in part, whether related to the use or redemption of a Ticket or not. You waive and release Bandwango, Eat Drink SLC and its subsidiaries, affiliates, partners, officers, directors, employees and agents from any Liabilities arising from or related to any act or omission of a Merchant in connection with your use of a Ticket or the goods, services or experiences a Merchant provides in connection with the Ticket. By purchasing, viewing a mobile version, printing, accepting, using or attempting to use any Ticket, you agree specifically to the terms on the Ticket and any additional deal-specific terms advertised in connection with and on the Ticket at the time of purchase. These rules apply to all Tickets that we make available, unless a particular Ticket’s fine print states otherwise, and except as otherwise required by law. In the event of a conflict between these rules and a Ticket’s fine print, the Ticket’s fine print will control. Any attempt to redeem a Ticket in violation of these Terms & Conditions will render the Ticket void. The Merchant is the sole issuer of the Ticket. Tickets are not redeemable for cash. Unauthorized or unlawful reproduction, resale, modification or trade of Tickets is prohibited. Pricing relating to certain Merchant offerings and Products on the site may change at any time in Bandwango and Eat Drink SLC's discretion, without notice.